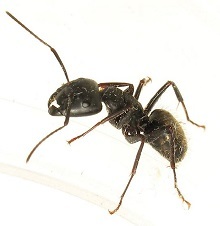 The Odorous House Ant is active all year activity mostly indoors during winter months and both indoors and outdoors from March to October Biology: This is a single node ant that may easily be confused with the Argentine Ant, but when viewed from above the single node of the Odorous house ant is not visible, as it is tucked up against the abdomen. It also is a shinier black color. The name is derived from the strong odor given off when the ants are crushed, said to resemble rotting coconuts. Workers are all the same size and forage in long, distinct trails. Colonies may have up to 10,000 workers in them, and nesting sites may be almost anywhere. Outdoors they make shallow soil nests under any material on the ground, within hollow trees, or in any other cavity available. Indoors they nest in wall voids, under insulation in crawl spaces, or within cavities in the wood. Sweet materials like honeydew or other sugar sources are their preferred foods. Characteristics Important in Control: Control of most ants includes correction of the attractions that drew them to a property, including harborage sites, food sources, and moisture conditions. Elimination of insects that provide protein or honeydew sources reduces ant foraging in an area, very important for this species, and cleanup of unnecessary debris or objects on the soil that provide harborage eliminate nesting. Ant bait products in granular, liquid, or gel formulations can be highly effective if the ants accept the bait. If the visible mounds of this species can be found it can be treated directly with a dust or liquid insecticide.